Addis Ababa,3rd April 2019 – A handover ceremony was held today at the African Union (AU) Headquarters for the Basis of Design (BOD) for the new AU-Pan African Veterinary Vaccine Centre (AU-PANVAC) laboratory facility. United States of America’s Ambassador to the AU, H.E. 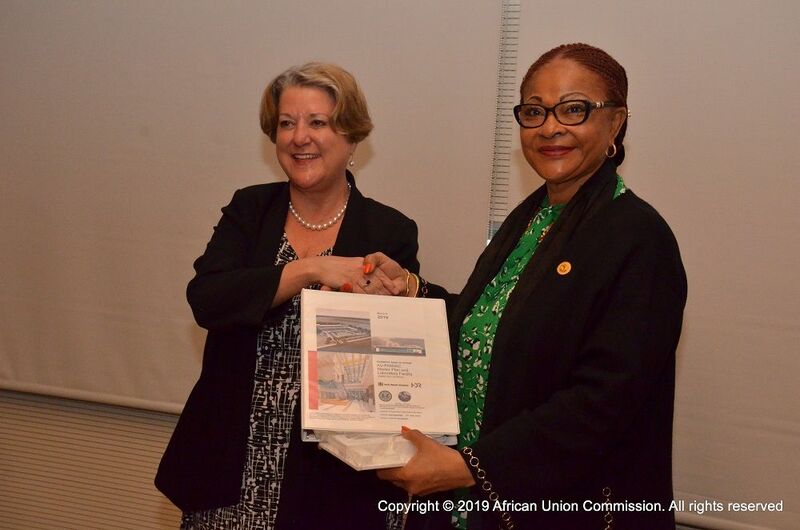 Mrs Mary Beth Leonard, handed over the BOD to African Union Commission’s Commissioner for Rural Economy and Agriculture, H.E. Amb. Josefa Sacko. AU-PANVAC is presently the only Organization mandated by the AU to provide International Independent Quality Control of all vaccines used in Africa and in addition, has the mandate to produce and distribute essential biological reagents for the surveillance and diagnosis of animal diseases. Presently PANVAC operates from laboratories inherited from the Ethiopian Government in the seventies and scattered within the National Veterinary Institute facility. The establishment of a new laboratory for AU-PANVAC to be based in Debre-Zeit, Ethiopia, is expected to consolidate all the activities of the Centre at one site and ensure that the activities are implemented according to best practices and in a safe and secure manner. The new facility will include the Continental Vaccine Bank, Quality Control Unit, Biological Reagent Production facility and a Training Centre amongst others. Speaking during the handover ceremony, H.E Sacko acknowledged the huge support provided by the US Government through its Biological Engagement Program, a part of the US Defense Threat Reduction Agency (DTRA); to the African Union through AU-PANVAC and indicated that the handover was the result of the transformative power of partnership between the AUC and the US Government. She highlighted the fact that AU-PANVAC is only one of four global rinderpest holding facilities and the only one to hold both materials and emergency preparedness vaccines. She thanked the US Government for its commitment towards global security and poverty alleviation in Africa and for the initiative to provide the design for the laboratory. H.E Leonard further assured AU-PANVAC of continuous support to the institution during the building process. Also present at the ceremony were; the Director AU-PANVAC, Dr. Nick Nwankpa; Dr. Charles Bodjo, the Biological Reagent Production Officer and other technical staff of AU-PANVAC. On the US Ambassadors team were, Dr. Larry Smith, the Regional Coordinator for the US Biological Engagement Programme under DTRA; Dr. Susan Boggs, Global Chemical and Biological Expert on Security from the Sandia Laboratories in the United States, Mr. Warren Hendrickson, Laboratory Design Architect of HDR Inc, Mr. Mohammed Raja DTRA Program specialist in Addis Ababa and Ms. Rebecka Chall, Political and Economic Assistant USA-AU.